The DV Select Kit 3 from Tiffen contains everything you need to get that spectacular outdoor shot or scenic portrait. A Solid Neutral Density 0.6 (2-stop) Filter from Tiffen has several uses and offers the possibility to achieve otherwise unachievable results. It enables the shooter to adjust exposure without affecting color balance. An ND filter appears gray and reduces the amount of light reaching either the sensor of a digital camera or the film plane of a traditional film camera. is part of the Hollywood FX series of filters. The Black Pro-Mist creates moderate image softening and modest-to-strong highlight flare, but without as much of a lightening effect in the shadow areas. Here's another tool to add to your portrait arsenal. As part of Tiffen's award-winning series of FX filters, the Black Pro-Mist gives you the option to add another dimension to your images. Part of the difference between a run-of-the-mill photograph and a "great" photograph is the attention to detail - and with the Tiffen Pro-Mist series of filters, you can tweak your images just enough to set them apart from everyone else's. Speaking generally, the 2-stop value (ND 0.6 - the filter's clear portion allows 4x more light to pass vs. darkest portion) effectively compensates average bright sky-to-foreground situations, and the soft transition is applicable more often to a scene than the hard transition. 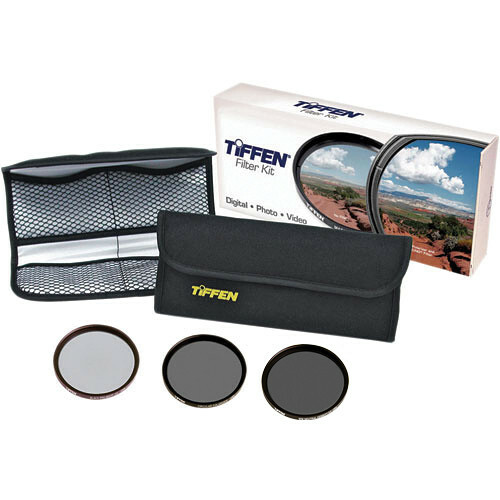 Tiffen's Polarizing filters are used to select which light rays enter your camera lens. They can remove unwanted reflections from non-metallic surfaces such as water or glass and also saturate colors providing better contrast. The effect can be seen through the viewfinder and changed by rotating the filter. The filter factor varies according to how the filter is rotated and its orientation to the sun. Polarizer: Between 2.3 and 2.8 (approx. +1.3 stops) - approx.